The Sunnyland Elementary School garden was established in 2014 with support from Common Threads. It expanded significantly in 2016, thanks to the PTA’s SAGE (Sunnyland Activists Garden Expansion) project which aims to promote health and experiential learning for kids through interactive and sustainable systems. The north-facing garden, which serves the education and exploration of the K-2nd grade students, grows plenty of greens, flowers, and blueberries. It also features a large, productive compost space. 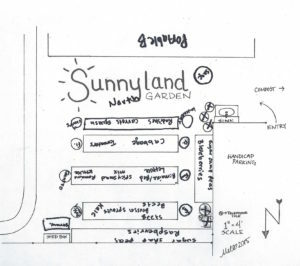 Sunnyland’s tiered south-facing garden is known for its mammoth sunflowers, prize-winning pumpkins, and juicy strawberries dripping over the sidewalk. This is where the older students have gardening classes and take pride in their hard work. 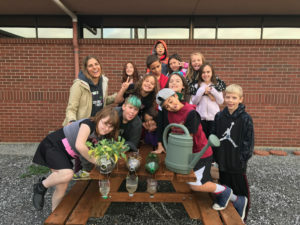 All together, these growing spaces support the ongoing experiential learning of nearly 300 students, 90% of whom can walk or bike from home to the garden; this gives the Sunnyland school garden a true sense of community. Sunnyland Elementary has approximately 924 square feet of growing space. It is located at 2800 James Street, Bellingham WA 98225-2639. If you’re interested in getting involved, Sunnyland Elementary has a Common Threads Facebook Group that you can join!